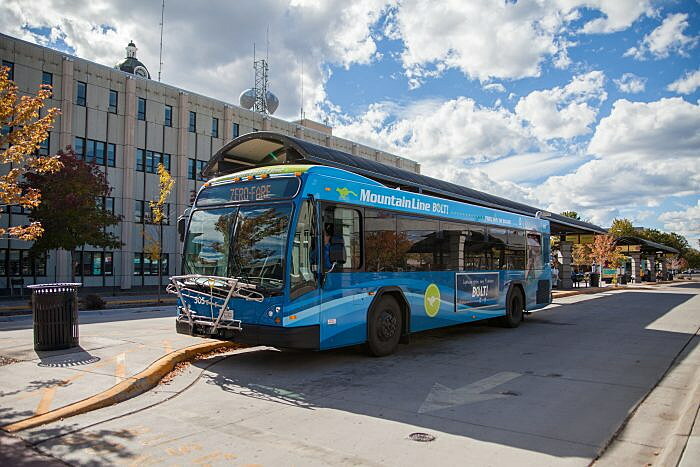 Four years ago, Mountain Line embarked on a partnership with the city and county of Missoula, along with 11 local businesses and organizations, to create Mountain Line’s Zero-fare bus program. Our goal was to remove barriers to riding public transit and increase ridership, while also improving our operating efficiency. The project has surpassed even the most optimistic predictions. Mountain Line now provides nearly 1.6 million rides a year, a more than 70 percent increase from 2015 levels. This unique public and private partnership has now grown to 24 member organizations. That is why we were thrilled to find out that we recently received – not one – but two federal grants during this funding cycle. The first, a “Low-No” emissions grant will allow us to purchase six electric buses for our fleet. These new buses will reduce overall tailpipe diesel emissions, including nearly 600 tons of carbon dioxide annually, and will significantly improve Missoula’s air quality. The second grant will allow us to upgrade our bus facilities, so that our bus stops become more accessible, safe and comfortable. It is rare for an agency to receive even one competitive grant in a year, let alone two in the same year. The ridership gains brought about by Zero-fare were instrumental in demonstrating the need that secured this funding for the Missoula community, and will result in cleaner air and improved bus stops. The direct benefits of higher transit ridership are well documented by transportation experts. Robust public transit systems make communities more livable and accessible, getting more people to work and school, and helping seniors and those with disabilities maintain and increase their independence. Public transit diverts single-occupancy vehicle trips, reducing traffic and parking congestion, and improves our air quality. The more people who ride transit, or choose to bike or walk, the more these benefits increase. In addition, many companies seeking to relocate place a premium on those areas that are walkable and well served by transit. By drastically increasing our ridership Mountain Line is now spending less per passenger than at any point in our 40 years of service. While transit ridership is declining in many cities nationally, Missoula continues to see an increase. As our mode share for transit also continues to increase, our high ridership relative to peer cities will help ensure that our sustainable transportation options in Missoula will continue to improve and expand. As Missoula continues to grow, Mountain Line is becoming even more important. New employers locating in Missoula means more employees commuting to work. And as the University of Montana is on track to grow, more students will be commuting to school. Meeting this new travel demand by simply building new roads and parking lots is expensive, impractical and can conflict with other community values. In contrast, a robust, affordable and efficient public bus system provides options for people to get to work and to school from which the entire Missoula community benefits — whether you ride the bus or not. The success of the Zero-fare program demonstrates how thoughtful public investments can be leveraged with private donations to achieve important community goals. As a result, Mountain Line and Missoula will soon receive 6 new electric buses and begin updating bus stop infrastructure throughout our system in the summer of 2019. Bus riders and our entire community owe a great debt of thanks to these forward-thinking businesses and organizations who believe that a city with accessible and affordable transportation truly benefits us all. Mountain Line’s current list of Zero-fare partners includes the University of Montana, ASUM Office of Transportation, City of Missoula, County of Missoula, Metropolitan Planning Organization, Providence St. Patrick Hospital, Community Medical Center, Missoula County Public Schools, the Missoula Parking Commission, Missoula Aging Services, Missoula Downtown Association, Southgate Mall, the Missoulian, Homeword, Destination Missoula, Missoula Federal Credit Union, Mountain Broadcasting, Trail 103.3, MMW Architects, Missoula Food Bank, the Missoula Midtown Association, MissoulaEvents.net, DJ & A Consultants, and Windfall Inc. Through our ’40 for 40’ campaign, we hope to continue adding new partners with a goal of 40 in honor of 40 years of public transit in Missoula. For more about how your business can become a Zero-fare partner, contact info@mountainline.com today. Bill Pfeiffer is Community Outreach Coordinator for Mountain Line. February 14. Climate Smart Missoula’s Monthly Meetup: Transportation & Smart Growth is this month’s topic. Imagine Nation Brewing from 5 – 7 p.m.
February 21. Celebrate the launch of Missoula Electric Co-op’s newest community solar project atop the KettleHouse brewery in Bonner. 5 – 7 pm.